Ferguson, Julie. 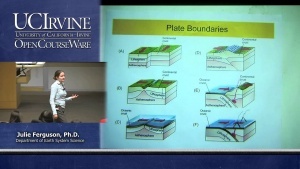 Introduction to Earth System Science 1 (UCI OpenCourseWare: University of California, Irvine), http://ocw.uci.edu/courses/ess_1_introduction_to_earth_syste... [March 14, 2015]. License: Creative Commons Attribution-ShareAlike 4.0 United States License. (http://creativecommons.org/licenses/by-sa/4.0/).